Custom chimney caps Dallas are vital to the performance of your chimney, call Chimney Wildlife Tech (214) 295-9318 for an estimate. Now is the perfect time to take a look at your chimney and start getting anything that needs repairs done before winter is here again and you have to miss out on using your fireplace. There are a few things that need regular inspection to ensure the proper functioning. One of these is custom chimney caps Dallas, your chimney cap plays a vital role in protecting your chimney from damage, preventing house and chimney fires and keeping animals out of your chimney. Most homeowners look for a problem with their custom chimney caps Dallas when they have experienced something like a water leak or birds or another animal being in the chimney. It is best to get custom chimney caps Dallas installed prior to these things happening. If your cap is allowing water to get into the chimney there are a few other things that can be happening up top and not seen. The chimney cap is in place to protect the mortar crown and mortar on your chase from the weather, sun and heat. This extends the life and quality of your chase for some time as it is not open for the regular damage and deterioration that occurs should it not be covered. In turn there is less of a chance of chase rot and breakdown with custom chimney caps Dallas in place. If you have custom custom chimney caps Dallas in place they will also stand as a guard to not allowing any birds or other animals to use your chimney to nest. This not being in place or custom chimney caps Dallas not being correctly installed can lead to animals getting into your home through the fireplace along with drafting issues with the smoke from a fire not having a clear passage out of the chimney. When the chimney is too blocked off this leads to chimney fires and is in fact the top cause of chimney fires and roof fires in homes. If you are wondering if your custom chimney caps Dallas can hold up to the heat and perform like it should the best thing to do is to get an inspection done. From the inspection a Certified Chimney Professional will be able to determine if your chimney cap was correctly installed, is the right size and if it is functioning like it should. Call Chimney Wildlife Tech (214) 295-9318, we have been in the custom chimney caps Dallas business for many years. We run our own metal shop where we custom make every aspect of your custom chimney caps Dallas to be perfect for your home. Each of our chimney caps come with a transferable Lifetime Warranty. Do you know the importance of having Dallas TX chimney caps installed? 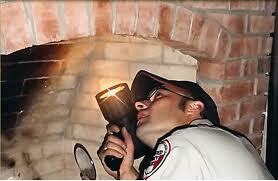 Call Chimney Wildlife Tech (214) 295-9318 for help getting yours inspected and installed. Did you know that about 25% of homes with chimneys do not have the Dallas TX chimney caps installed or have the wrong type of chimney cap installed on their homes? A chimney cap plays quite an important role in the performance of your chimney, along with a very key role in preventing chimney and roof fires. Do you know if your chimney has a correctly installed chimney cap on it that is performing perfectly? The best way to find out is to have a Certified Chimney Professional do an inspection on your chimney cap. Dallas TX chimney caps help to keep the fireplace drafting correctly. They also prevent any burning particles from rising out of your chimney and landing on your roof. When this happens it is quite possible that a chimney or roof fire will follow shortly. Having a correctly installed chimney cap on your fireplace ensures that your home is protected from the possibility of these lit particles creating fires. Another key role that Dallas TX chimney caps play is the prevention of birds and other wildlife animals getting into your chimney and nesting there. Right now is most animals breeding season, this means most will be looking for homes to nest in and often the homes they find are chimneys with no caps installed or with caps that do not have animal guards in place. This can cause quite an annoyance to you as the homeowner and opens your home to animals getting in through the fireplace. When the nesting materials are left in your chimney it can cause blockages that prevent the correct drafting from occurring allowing smoke to blow back into your home and can also get hot enough to lite the nesting materials on fire and cause chimney fires. Dallas TX chimney caps also prevent water leaks in your chimney and protect your mortar crown and chase from break down due to the weather and the elements. When you have a correctly sized and installed chimney cap in place the cap helps to seal your chimney from water and protect the mortar crown. When the mortar crown begins to break down it can cause any bricks and mortar on your chase to being to have spalding issues, if left unhandled for too long this can lead to the entire break down and need for replacement of your chase. If you have a wooden chase the water getting in can cause your chase to rot and need full replacement. If you are unsure if you need Dallas TX chimney caps call the Certified Chimney Professionals at Chimney Wildlife Tech, (214) 295-9318, for an inspection and evaluation on your caps performance.